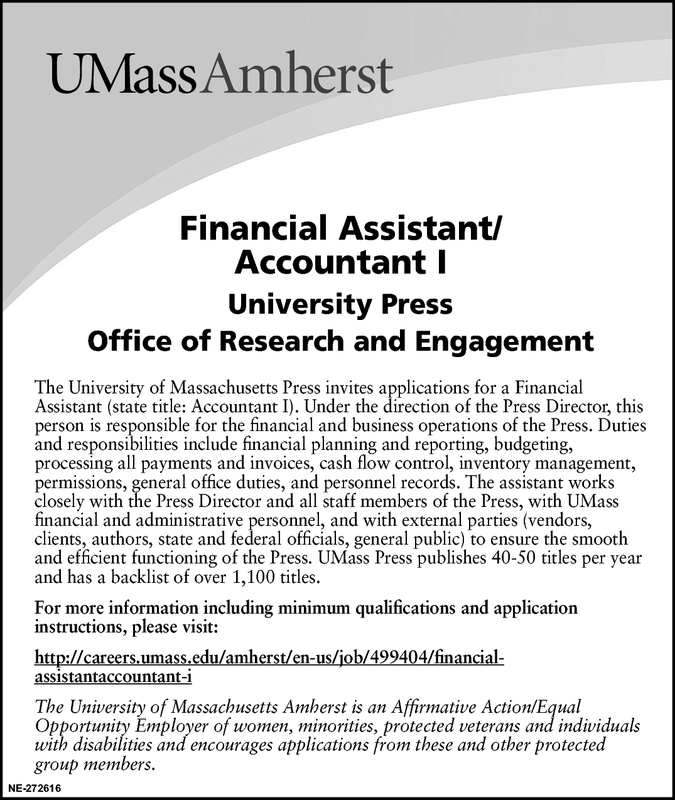 The University of Massachusetts Press invites applications for a Financial Assistant (state title: Accountant I). Under the direction of the Press Director, this person is responsible for the financial and business operations of the Press. Duties and responsibilities include financial planning and reporting, budgeting, processing all payments and invoices, cash flow control, inventory management, permissions, general office duties, and personnel records. The assistant works closely with the Press Director and all staff members of the Press, with UMass financial and administrative personnel, and with external parties (vendors, clients, authors, state and federal officials, general public) to ensure the smooth and efficient functioning of the Press. UMass Press publishes 40-50 titles per year and has a backlist of over 1,100 titles.